In the framework of the working visit to Vietnam of Mr. Mark Rutte - Dutch Prime Minister and Ms. Sonnema - Vice Minister of Agriculture, Nature and Food Quality, the Embassy of the Netherlands collaborated with the Ministry of Agriculture and Rural Development (MARD), the Ministry of Industry and Trade (MOIT) and Vietnam National University of Agriculture (VNUA) to organize the seminar "An Impulse to Innovative Agro Business – Let’s Work Together" on April 9th, 2019 at Melia Hotel, Hanoi. On VNUA’s side, Prof. Dr. Nguyen Thi Lan - President of VNUA, Prof. Dr. Tran Duc Vien - Chairman of the Board of Trustees, representative leaders of the International Cooperation Office, the Office of Science and Technology, the Faculties of Accounting and Business Administration, Economics and Rural Development, Agronomy, the Institute of Crops Research and Development, and the Center for Public Relations and Students Supports participated in the event. 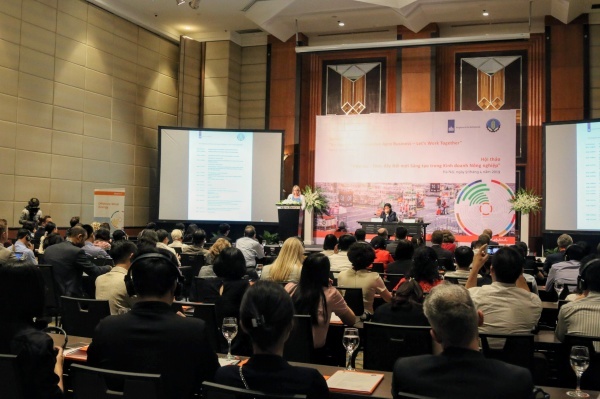 The seminar also welcomed more than 70 leading enterprises in the Netherlands and the leaders of many ministries, enterprises and research agencies in Vietnam. 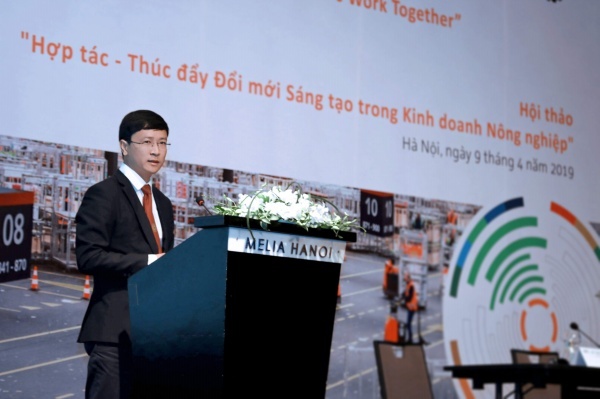 Vietnam and the Netherlands, despite the geographical distance, have had long-standing trade relations. In the early 17th century, the merchant fleets of the Dutch East India Company arrived at Hoi An port in Quang Nam province, contributing to bringing Hoi An port into the global trade network and also laying the first bricks for trade relations between the two countries. The Netherlands is currently the largest European investor in Vietnam with a total registered capital of over 9.5 billion USD, with many well-known corporations such as Heineken, Unilever, and Shell. In 2018, bilateral trade turnover of the Netherlands and Vietnam reached over 7.84 billion USD (about 1.6% of the total trade turnover of the country and nearly 14.6% of the total trade turnover of Vietnam with EU countries). In 2018, nearly 80,000 Dutch tourists visited Vietnam, ranked the 4th among European countries. In the field of agriculture, the Netherlands is considered a great power in overcoming natural disasters to develop high value and sustainable agriculture. The Netherlands has many difficulties in agricultural production including the small area of ​​natural land (only about one eighth of Vietnam’s), adverse natural conditions (2/3 of the land area was previously submerged due to geographically located relatively lower than the sea level), and only 2% of the land workers working in the agricultural sector while the total population of the Netherlands is about 17 million people. Despite all the difficulties, the Netherlands accounts for 60% of the world's greenhouse area, creating many high value commodity chains. In recent years, agricultural products’ export value of the Netherlands has reached over 110 billion USD, globally ranked the second after the United States. On this occasion, Prof. Dr. Nguyen Thi Lan, Mr. 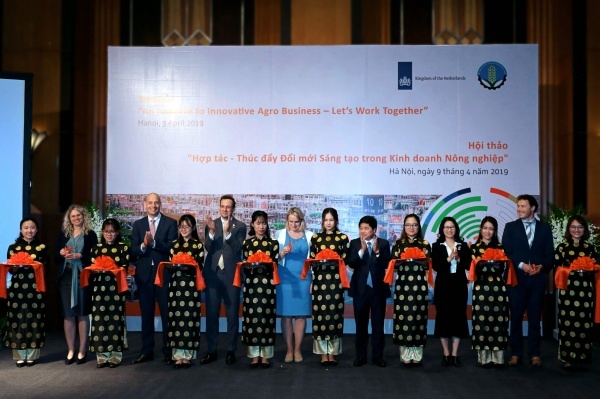 Le Quoc Doanh - Vietnam’s Deputy Minister of Agriculture and Rural Development, Ms. Sonnema - Dutch Vice Minister of Agriculture, and other Dutch representative cut the ribbon to officially launch the OKP project. Please click here for more information about the project.